The B&O Railroad Museum's roster of rolling stock, historic railway buildings, and assortment of memorabilia from stations and trains makes it a must-visit for train enthusiasts. But even for those who are not railroad fanatics, this is one of the best sights in Baltimore and a fascinating place for the whole family. Housed in the huge Roundhouse is an enormous collection of locomotives, passenger cars, classic heritage trains, mail cars, and Pullman sleepers. 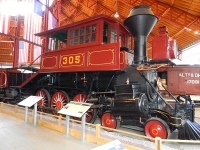 A full-scale model of the first locomotive, Tom Thumb, is on display along with a red caboose from 1907. Other exhibits include posters, historic photographs and newspaper cuttings, as well as a superb model railway, and numerous interactive and entertaining exhibits. Some recreate experiments from the 1830s such as sail-powered carriages, hand cranks and propulsion using dogs or horses. The B&O was the first railroad in the US, dating from 1827, and the museum is located on the site of the first station in America. Opening times: Monday to Saturday 10am-4pm, Sunday 11am-4pm (last admission half hour before closing). Admission: $18 adults, $12 children 2-12. Concessions available.